The exhibition Entropic Union signalled Shepley’s departure from more materially based studio methodologies towards an occupation of the image and audience engagement. The exhibition was a two-person exhibition – Shepley and McCarthy, curated by Steve Dutton and comprised some forty photographic works and interventions by each artist. Shepley referenced the place of fragments and removals from both construction and demolition sites, exploring notions of entropy and places of dis-assembly by focusing on images of detritus in rubbish skips in various locations around Europe. 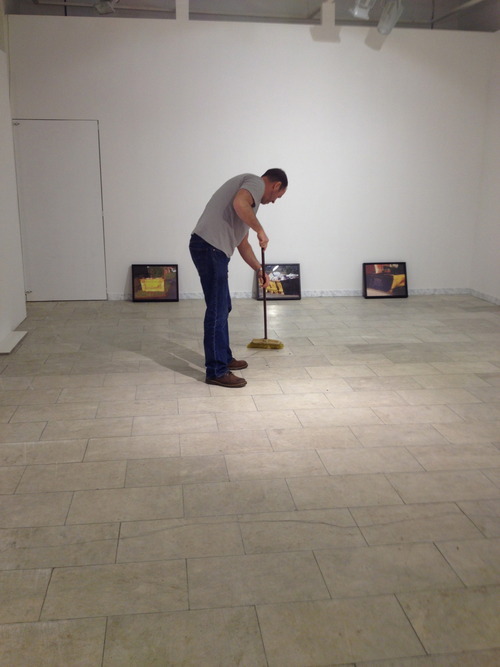 These images drew parallels with the gallery as a site of detritus. The project aimed to rethink expectations about the artwork, opening up the space to problematic assumptions of what may constitute a work of art. Visitors were invited to scrawl, scribble, draw, doodle, write graffiti and obliterate the artist’s unframed photographs on tables in the gallery spaces, which were then re-hung within the exhibition. The project, through the use of visitor intervention attempted to interrupt or occupy the image to bring it into the present – the now. The artwork experienced as incomplete project or ruin was one by-product of this process. This ongoing process within the potential space of ruin or incompleteness was further explored in the joint paper by Shepley and Dutton at ‘Sensuous Knowledge 7’ in January 2013 ‘The Institute of Ruin’, where this question of how the practice of suspending the work in an unresolved state was explored in detail in relation to the creation of institutions. Entropic Union examined how practice related uneasily to what Temple described in the catalogue essay as ‘the contemporary pre-occupation with art-works as products, readily consumed objects whose material and sensual qualities are reduced to surface effect’ and ‘underlined the creative potential of the fragment to restore our embodied relationship to the world’.